FIRST Minister Alex Salmond has arrived in China, hoping to build on growing trade with one of the world’s leading economies – and a mutual interest in whisky and golf. Drinks company Diageo and golf’s Ryder Cup trophy, which will be contested between Europe and the US at Gleneagles next year, are taking part in the tour – Mr Salmond made a speech at Diageo’s Johnnie Walker House, a bar, museum and retail outlet in the Chinese capital. 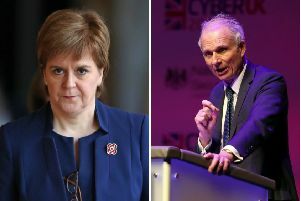 As well as laying the foundations for further trade links, the First Minister will come under pressure to raise the thorny issue of human rights, a challenge that has proven problematic in recent years. He will not want to jeopardise relations, especially with whisky enjoying a boom in east Asia. Exports from Scotland to China are reported to have increased from £265 million in 2007 to £498m in 2012, and a lot of that is down to Chinese appreciation of Scotch whisky. Mr Salmond has long maintained he raises human rights in meetings with the Chinese. But last year it emerged he distanced himself from the Dalai Lama’s visit to Scotland by personally reassuring the Chinese ambassador the trip had nothing to do with his government. The Scottish Government revealed recently it had been looking overseas for possible buyers for Grangemouth, when concerns grew that Ineos might pull out of the oil refinery and petrochemical plant. In Beijing yesterday, the First Minister said: “As the world’s most populous country and one of its fastest-growing economies, China is exploring new domestic energy supplies and investing heavily in the industry through mergers and acquisitions overseas. “Scotland’s enviable reputation as the European capital of oil and gas, and our ongoing pioneering work in exploration and extraction, gives us a strong appeal to Chinese firms looking for both domestic and international future energy supplies. “In the past few years, we’ve seen increased investment from China into the industry in Scotland, with CNOOC’s [Chinese National Offshore Oil Corporation] acquisition of Nexen, and Sinopec’s interest in Talisman’s North Sea business. And this week, I’m introducing some of our most innovative companies to the senior leadership of these energy giants, to help them do more business in this market. Scottish companies and business representatives are hopeful that further links can be built.